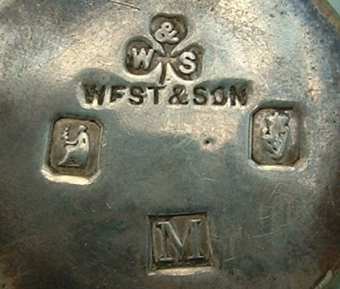 The firm dates its origin to 1720, but the first documented of the family's association with silver trade is in 1748 when John West (born 1734) apprenticed to Bartholomew Mosse, Master Silversmith of Dublin. 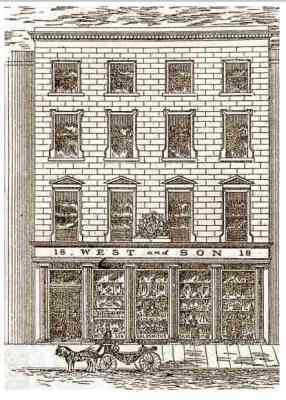 He was followed by his brother Matthew (1747 - 1806) who apprentices in 1762. 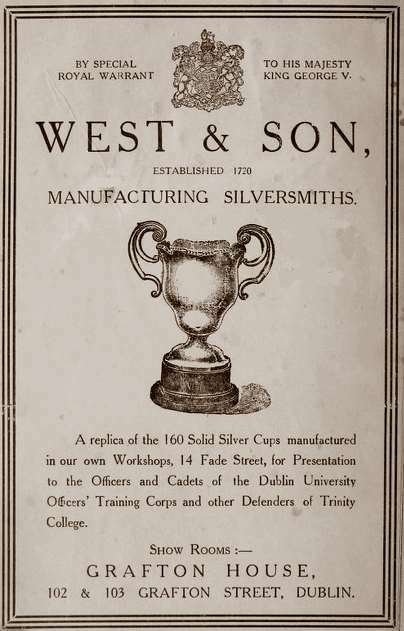 After their apprenticeship both were active as silversmiths and Matthew became Master of the Company of Goldsmiths in 1783/4 and one of the most renowned silversmiths of Dublin. Matthew West was active at Skinner's Row. 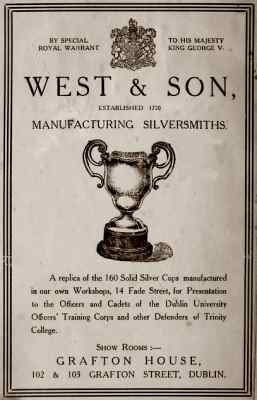 In the 19th century the family continued the silversmiths and retailers business as Clarke & West (c. 1803, Capel Street), Matthew West, Matthew West & Sons (c.1825) and later as James West & Son (from 1841 in new premises at 18/19, College Green), becoming one of the foremost jewellers in Ireland. 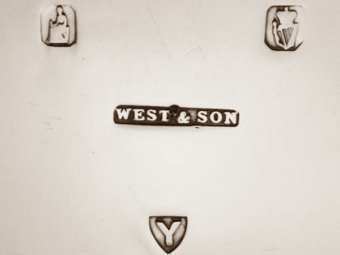 The British Royal Collection has two brooches made by West & Son. 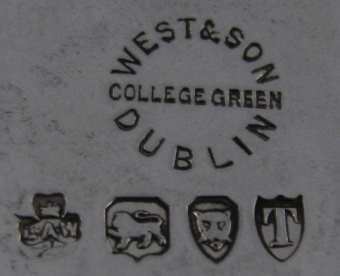 They were bought by Prince Albert for Queen Victoria on a visit to Dublin in 1849. 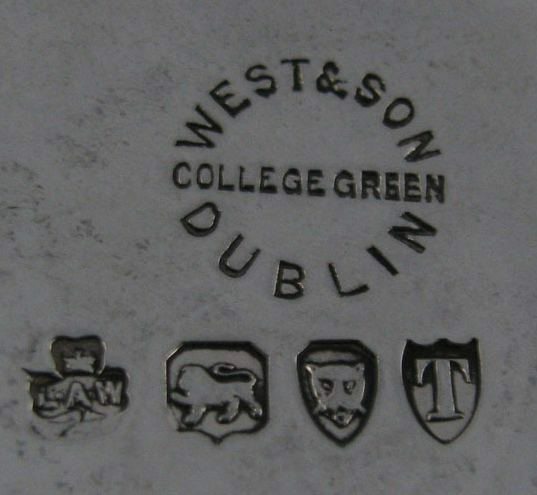 West & Son participated to the 1851 Great Exhibition in London and to the Dublin Exhibition of 1853. 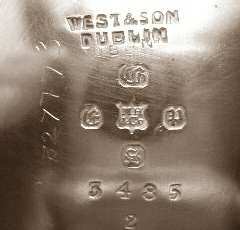 Their replicas of antique Irish ornaments, characterized by sinuous, intricate patterning, played an important role in the revival of ancient Celtic designs and in the development of Arts and Crafts movement. 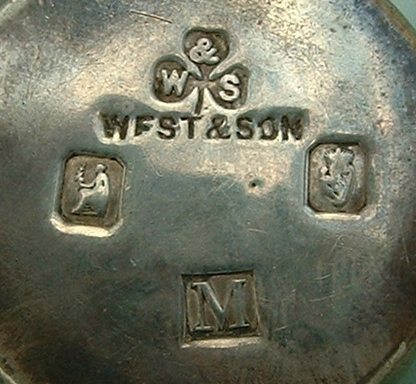 After the death of James West (1877) the firm was managed by his son Langley Archer West (d. 1932) in partnership (1902-1912) with Charles Howard Lawson, George William Thornley and George Crowly. 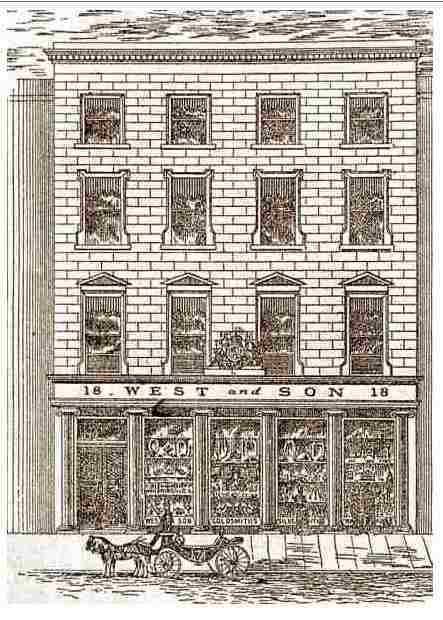 In 1912 the firm transferred to new premises at 102/103 Grafton Street, Dublin (from 1965 at 33 Grafton Street). West & Son closed on 13 February 2010.